Get ready for some surprising recommendations. Eczema, asthma, and food allergies are all on the rise in children, each having more than doubled in the last several decades. This rapid increase has lead to many differing recommendations on the timing and selection of foods offered to babies, to err on the side of caution before scientific studies were completed. A January 2008 evidence-based policy from the American Academy of Pediatrics turns some of this conventional wisdom on its head. 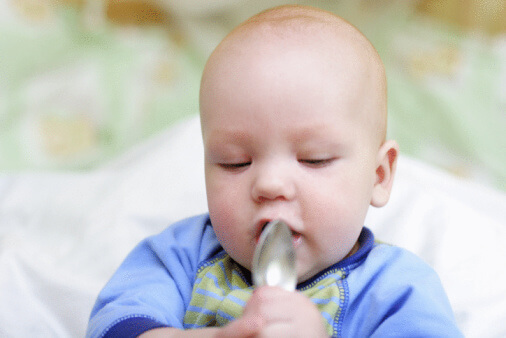 For preventing allergies, when is it best to start solids for babies? Previously, it was recommended to delay solids until 6 months if possible, and to limit the choices to things like rice cereal, oatmeal, or barley if they must be started sooner. The new policy reports that solids should not be started before 4 to 6 months, but that there is no convincing evidence that delaying any solids beyond this period helps to prevent allergies. In fact, with some foods, starting on the earlier side may even help. What about highly allergic foods such as eggs, peanuts, milk, or fish? The previous guidelines were that in allergic families, whole cow milk should be delayed until 12 months of age; eggs until 2 years; and nuts, peanuts, and fish until age 3. The new guidelines say that there is no convincing evidence that delaying even eggs (yolks or whites), fish, milk, nuts, and peanuts beyond 6 months prevents allergies! A few things to keep in mind: First, this discussion is only about preventing asthma, eczema, and food allergies. There are other reasons to delay certain foods (e.g. honey to prevent botulism, whole peanuts to prevent choking). Second, if a child does show signs of an allergic reaction, removing the possible culprits from the diet is wise — these guidelines are about preventing, not treating allergies. Third, these new guidelines are not the final word, they are just the current state of the science. Other benefits of particular timing may one day be uncovered. Finally, I am a fan of introducing a wide variety of healthy foods to babies between 6 and 12 months old, but I prefer organic foods for babies in the first year when possible. Particularly, if I were going to give some of the more allergenic foods like eggs, or cheese, milk, or nuts, I would be even more inclined to choose organic. AAP Clinical Report: Greer FR, Sicherer SH, Burks AW, and the Committee on Nutrition and the Section on Allergy and Immunology. Effects of Early Nutritional Interventions on the Development of Atopic Disease in Infants and Children: The Role of Maternal Dietary Restriction, Breastfeeding, Timing of Introduction of Complementary Foods, and Hydrolyzed Formulas. Pediatrics2008; 121: 183-191.